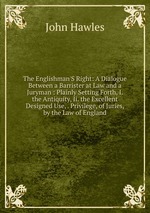 Аннотация к книге "The Englishman`S Right: A Dialogue Between a Barrister at Law and a Juryman : Plainly Setting Forth, I. the Antiquity, Ii. the Excellent Designed Use, . Privilege, of Juries, by the Law of England"